Can you believe it’s already January? Many of us are now ready to welcome 2016 with some very big sounding New Year’s Resolutions. After all the Christmas and New Year’s festivities that very often involve too much food (at least in my case), starting to exercise and losing some extra weight is at the top of that list, am I right? Most New Year’s resolutions are fun to make, but unfortunately a bit harder to maintain. 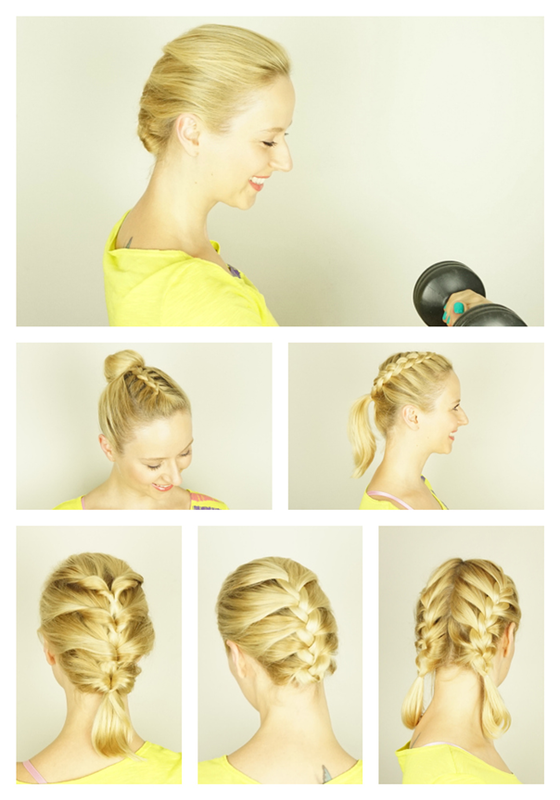 So why not try these 5 easy and cute hairstyles for the gym to make us look and feel great while we start to take action towards achieving our goals? A cute hairstyle can do wonders to boost our self confidence and with that, increase our chance of success! 😉 Why not have some fun while we’re at it? All of these hairstyles can be done on both long and short hair! As you can see, my hair is quite short and I have layers. Take a look at these examples and choose one that’s perfect for you! 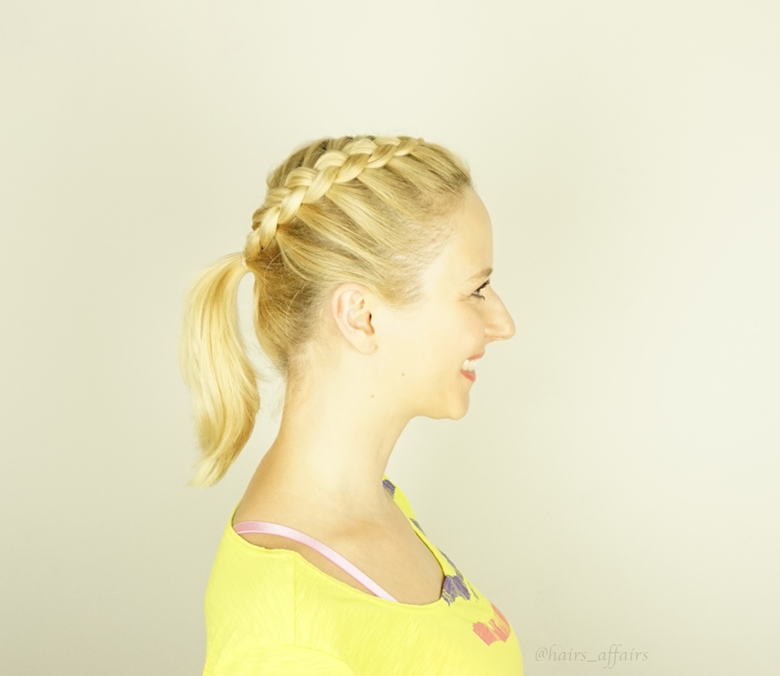 The classic french braid is so versatile that not only can it be worn on elegant occasions, but it’s also simple and quick enough to do for the gym! And it suits everyone! If you feel your hair is too long to tuck your braid in, or you simply prefer to have it down, you can just ignore the last step. 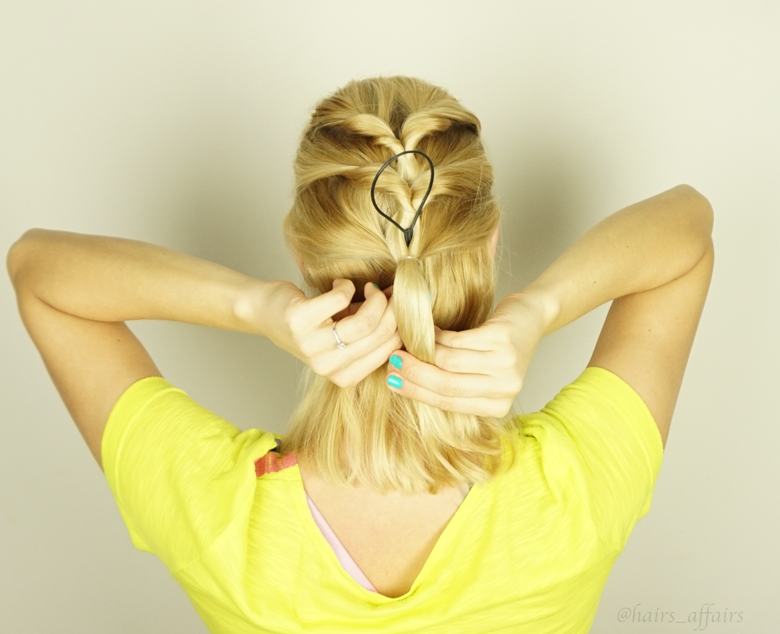 Pick up a U shaped section on the top of your head and divide it into 3 strands. Start crossing the outer strands OVER the middle one (start with which ever side feels natural to you). The third time you cross over, add a new section of hair from the hairline in the front, just below your U section, direct it to the back and add it into that strand. Repeat on the other side. Keep repeating step 2 all the way down. Once you get to the nape of your neck and all hair is incorporated into the braid, finish braiding a normal 3 strand braid all the way down and secure it with an elastic. If your hair has shorter layers around your face and you want to prevent them from falling out while you’re exercising, you might want to opt in for these super cute pigtails. 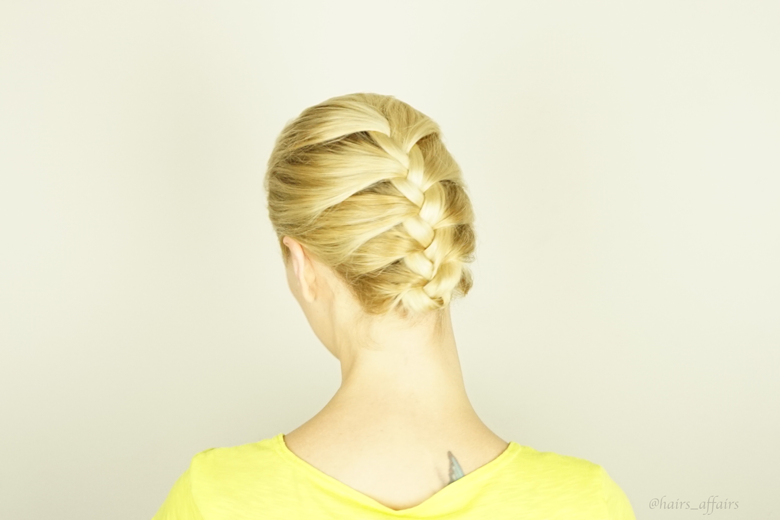 Divide your hair into two sections and make two french braids instead of one. You can part your hair through the middle all the way from the top to the nape of your neck, or if you prefer, make a side parting on the top, that goes from the side diagonally towards the middle, and then part the hair in the back of your head in the middle. The parting does not have to be perfect! 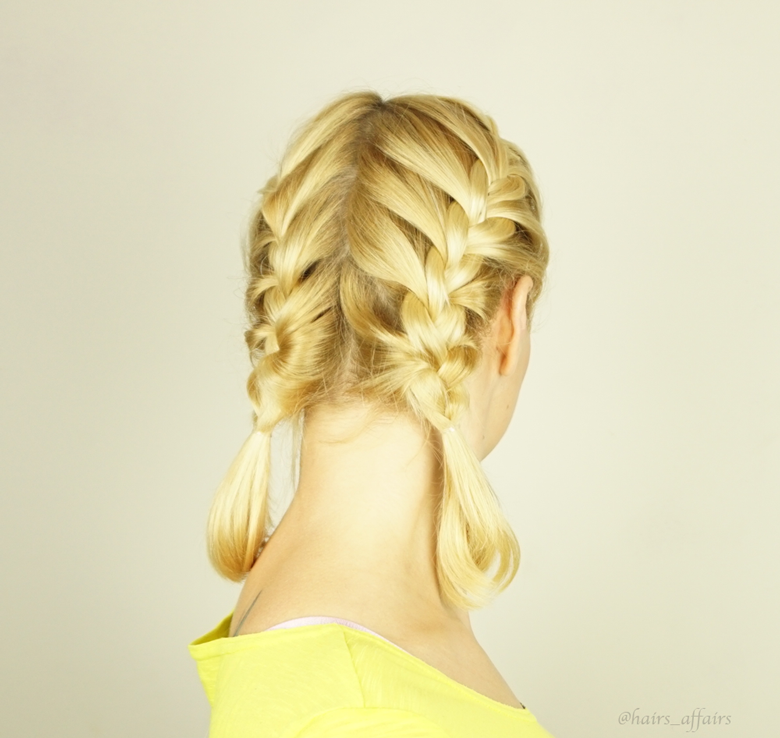 Now just follow the above steps for the french braid and repeat on each side. 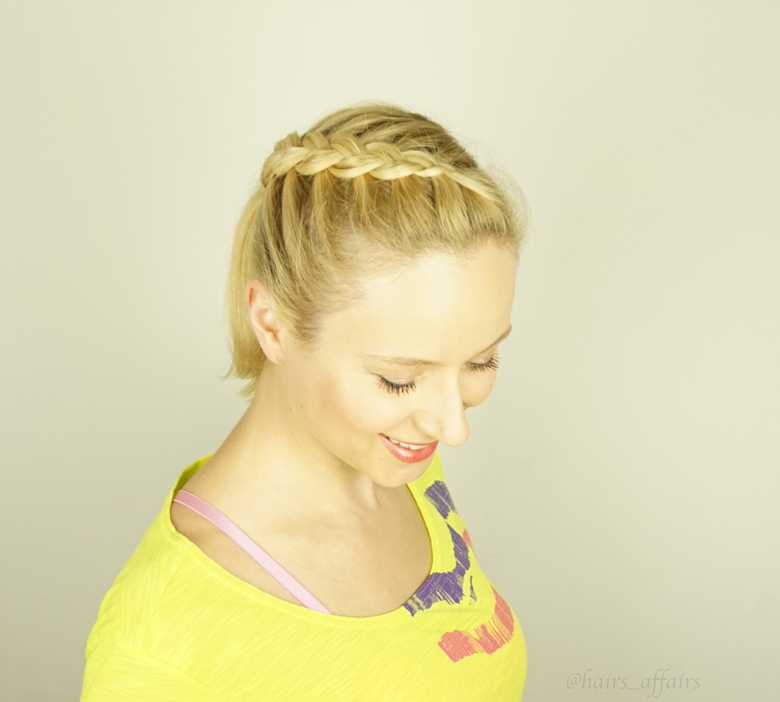 If you have bangs or shorter layers, this braid will not only spice up an otherwise boring ponytail, but it will also insure that all the short pieces will stay out of your face for good! Make a deep side parting. Now pick up a small triangular section from the front hairline diagonally to the parting. Divide this into 3 strands. Start crossing the outer strands UNDER the middle one. After crossing under the third time, start incorporating new sections from the sides into the braid (from the hairline in the front, and from the parting line in the top and back). Remember to imagine from the start where you’ll want the ponytail to sit and braid in that direction. That way you’ll avoid bulks after pulling the braid back into the pony. Once you’ve gotten to the back of your head and you’ve added your last section from the top of the ear into the braid, braid a bit further down without adding in new hair and secure the braid with an elastic. Part off a mohawk section (the width should be about from one peak of an eyebrow to the peak of the other eyebrow) on the top of your head and tie the rest of the hair with an elastic temporarily. Look for the instructions above on the dutch braid and braid this section from the front to the back, then secure the braid with an elastic. The braid should finish where the bun will sit. 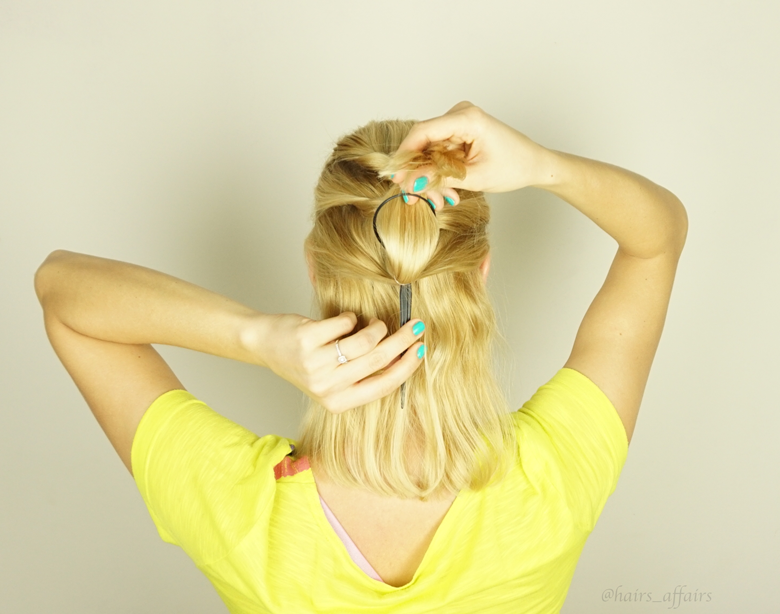 Now brush the rest of the hair of upwards and make a ponytail on the top of your head, right at the end of the braid. 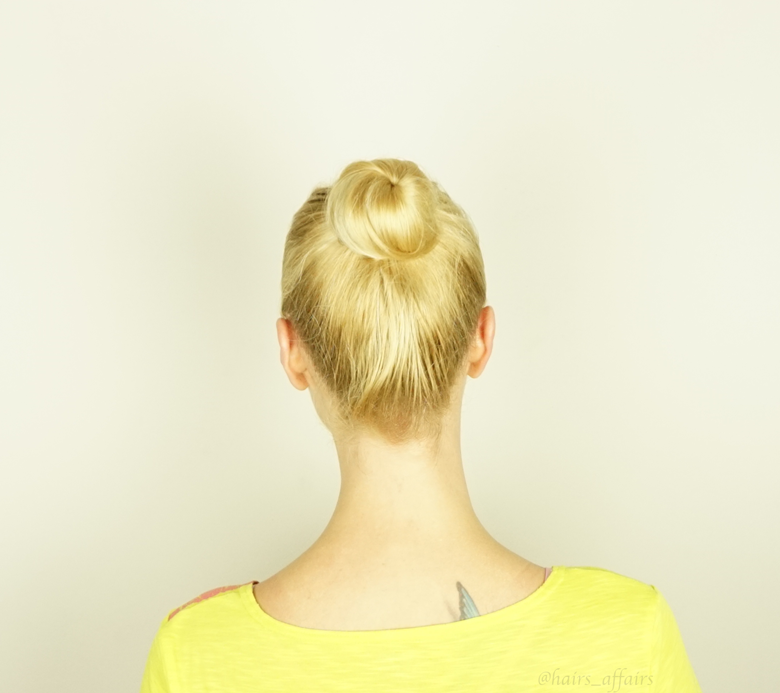 Twist the ponytail and place it around its nape, use bobby pins to secure it in place. 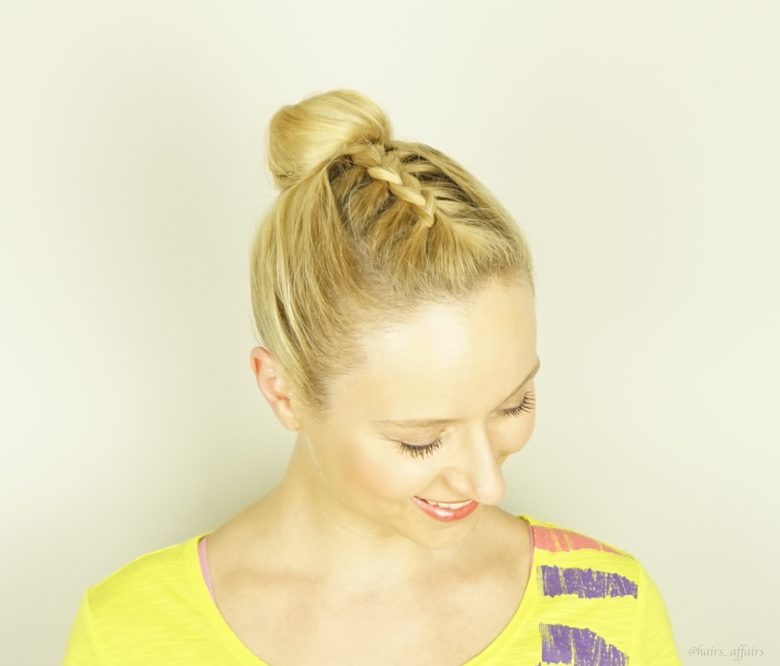 If you want a quick but interesting looking hairstyle, but haven’t mastered the art of braiding quite yet, do not fear – I have something very easy for you as well – the topsy tail braid. If you can tie a pony tail, you can do this. It’s not completely necessary, but you might find a topsy tail maker quite helpful. Part the first U shaped section on the top of you head and tie it into a ponytail with a clear elastic (or one that matches your hair colour). Pick up a new section of hair below on each side and tie them off together with the previous ponytail, right under the first one. Now take you topsy tail maker or fingers and repeat what you just did. If you don’t have this maker, don’t worry, simply use your finger to make a little hole right above the elastic and pull your pony over and through that hole. Tighten the elastic if necessary. Keep repeating step 3 as many times as necessary (depending on the size of your sections) until you get all the way down. To make it look fuller, you can gently pull on the twists that formed near the elastics. Now try one of these, or more, and go get in shape gorgeous! 🙂 Are you ready? Remember to have fun while you’re doing it! 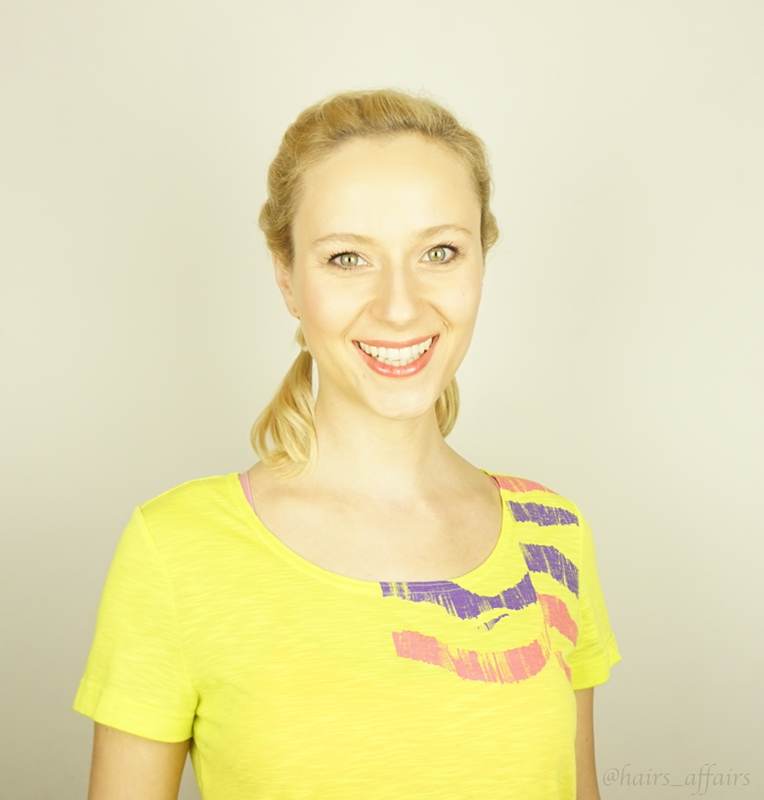 For more great hair ideas check out Hair_Affairs!